Fast food franchise holder Camex Restaurants Inc. (Church’s Chicken, Mario’s Pizza and Quiznos), yesterday signed a Memorandum of Understanding (MoU) with Giftland OfficeMax, which would see the company investing over $50 million, while occupying sections of the latter company’s multi-billion-dollar mega-mall which is expected to open its doors early in 2013 at Liliendaal, East Coast of Demerara. 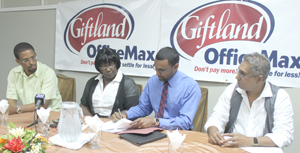 (From left) Chief Executive Officer (CEO) of Camex Restaurant Inc. Terrence Campbell, and Director of Finance Christine Bennett-Blair look on as CEO of Giftland OfficeMax Ian Ramdeo signs the MoU in the presence of Giftland’s President Roy Beepat. All agreements will be renewable annually. The signing was held at the Georgetown Club, 208 Camp Street, South Cummingsburg, Georgetown. In attendance were several representatives of the establishments:- Chief Executive Officer (CEO) of Camex Restaurants Inc. Terrence Campbell, Director of Finance at Camex Inc. Christine Bennett-Blair, CEO of Giftland OfficeMax Ian Ramdeo, and President of Giftland OfficeMax, Roy Beepat. The MoU was signed between Ms. Bennett-Blair and Mr. Ramdeo. The mega-mall is being financed through support from Commercial Banks as well as ‘two private investors. It will include over 140 specialty stores, a modern interior design with nine 20-ft aquariums, spacious walkways and convenient seating areas with six escalators and four elevators, famous restaurant franchises and a food court with over 20 local and international cuisine choices, secure parking for over 600cars, bus terminal and valet parking. Services such as ATMs for all banks, beauty salons, and barbershops, spas, postal and bill payment services will also be available, and expansion plans include more shops, entertainment outlets, supermarkets and a multi-level car park. The mall will reportedly be the largest of its kind in Guyana – a little over 170,000 square feet. The 10-acre plot of land was acquired by Giftland OfficeMax in 2007, through the Guyana Office for Investment (GO-Invest), but construction did not commence until 2009.